Linda Beck passed away Monday, April 2, 2018, at home. She was born Oct. 28, 1943, in Gregory, SD, to Glendon and Keithia (Hosack) Rowan, Linda grew up in rural Mills for all but one year in Osceola, NE. 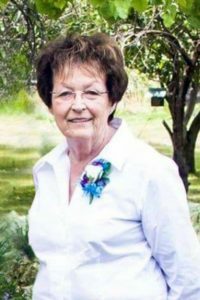 She attended Knapp School half a mile from her home where she would ride her bicycle to play with her best friends Lois and Norma Schrader. She helped her mom in the garden and helped out on the family farm. Linda attended Keya Paha High School. She worked as a nurse’s aide at Burke Hospital before she married Frank Beck on Oct. 22, 1961, in the Gregory Methodist Church. They made their first home in Burton, NE and later near Dallas, SD. With two children, Todd and Pam, Linda devoted herself to her family and helping on the farm. It was then that Linda’s love for the church was ignited, traveling from South Dakota to the Mills Church nearly every Sunday. The family moved back to the Mills area for the last 50 years where Linda was known for her cooking and baking skills. She fed a lot of help over the years and showed her love for others through cooking. Linda wore her love for her church on her sleeve. She was the first to arrive most Sundays to help make the coffee, arguably to make sure the coffee wasn’t made too strong but mostly because she didn’t know how NOT to leave the house early. Linda was baptized for the first time on June 16, 2013, in the Keya Paha River when she felt the calling. “She didn’t want to do it but for Linda it was a step of obedience,” said the Rev. Kenly Udd, pastor at the Mills Church. Linda was preceded in death by her parents, Glendon and Keithia; father-in-law Emmet Beck; and sister-in-law Mavis Rowan. She is survived by her husband, Frank of Mills, NE; mother-in-law Shirley Beck of Winner, SD; brother Harlan Rowan of Clarks, NE; son Todd Beck of Mills, NE; daughter Pamela Reber (Gary) of Lincoln, NE; grandchildren Andy Beck of Savannah, GA; Callie Beck (Joe DeCrane) of Watertown, SD; Jamie Benedict of Brookings, SD; Rowan Taylor of Lincoln, NE; Tyler Beck of Mills, NE; Ellen Reber (Matt Goeser) of Denver, CO; Will Reber of New York, NY; and seven great-grandchildren. Linda spent her life caring for her family and took great pride in doing so. Her grandchildren were her pride and joy. She was sad for the people she left behind but she was at peace for whenever her time came.